I am slightly biased against this book in that I am not Catholic, and do not always love the church fathers (due to the anti-Semitism and theologies of some of them). But I was excited to read this none-the-less since I actually do love church history (even in some of its ugliness), and was hoping to develop a stronger knowledge of the church fathers, and greater appreciation for the Catholic portion of the Body of Messiah and their traditions. 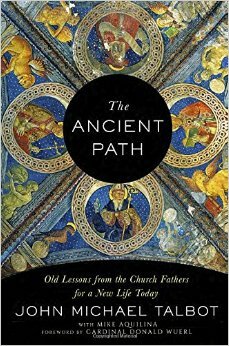 The Ancient Path was not as I expected as it is more of a personal memoir that weaves in the theologies and teachings of the church fathers and contemporary mentors of the author, rather than disclosing pure history. I did learn some things, although I would not recommend this as a resource to gain knowledge of the church fathers or history. The sub-title is misleading on this point. It is actually not about the church fathers or church history at all, but rather a poetic and emotional journey to connect to God through the Catholic experience (based on a loose foundation of the Catholic fathers). It is beautifully written, yet it was hard for me to connect with the writing–probably due to my very different spiritual perspective, and also in that it was so unlike my expectations that I had trouble knowing where the story was going or what to get out of it. I received a complimentary copy of this book through Blogging for Books from Image Books.